I'm sharing my first projects (good enough to post!) with the Silhouette Cameo that I finally learned how to use. It was surprisingly easy, and similar in concept to the Cricut Gypsy with the grouping and welding features. 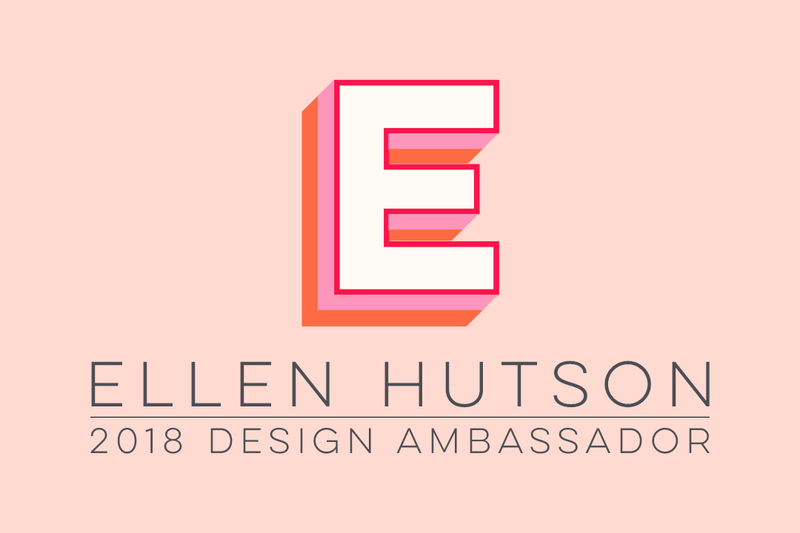 But, you can erase any section of line, draw your own cut lines, and of course use any font that's on your computer. I still can't get over how you can think of something, draw it on the software, and it gets cut out. Amazing. 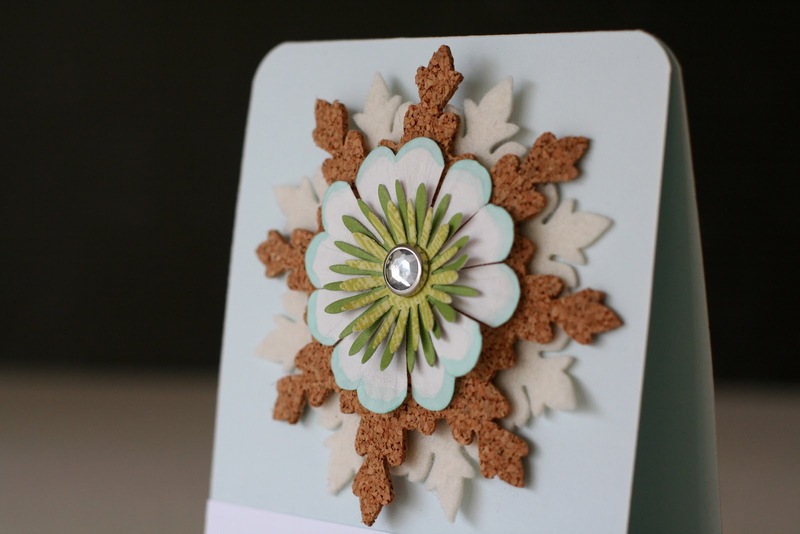 Now before someone breaks into my house to rip this Damask Snowflake die out of my hands, I will assure you that it's the only card in this post to use it. Five cards in a couple days are quite enough for now! Still using the split die-cut idea from Papertrey. 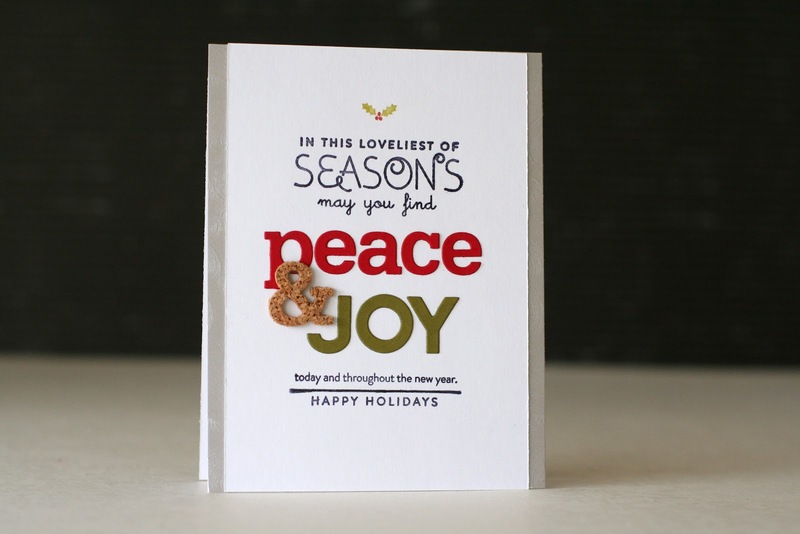 It took all of ten minutes to design this card on the Silhouette. And now that I'm more familiar with the process, I'm sure another one would only take a couple minutes. 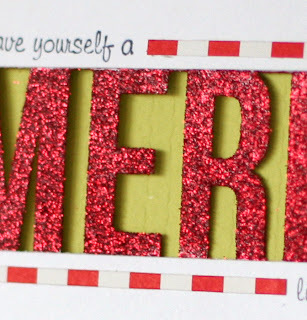 I drew two rectangles, typed "MERRY" in the middle, resized it so they overlap, and welded everything together. Done! This card and the next one are inspired by the Less Is More challenge to use glitz and glam. 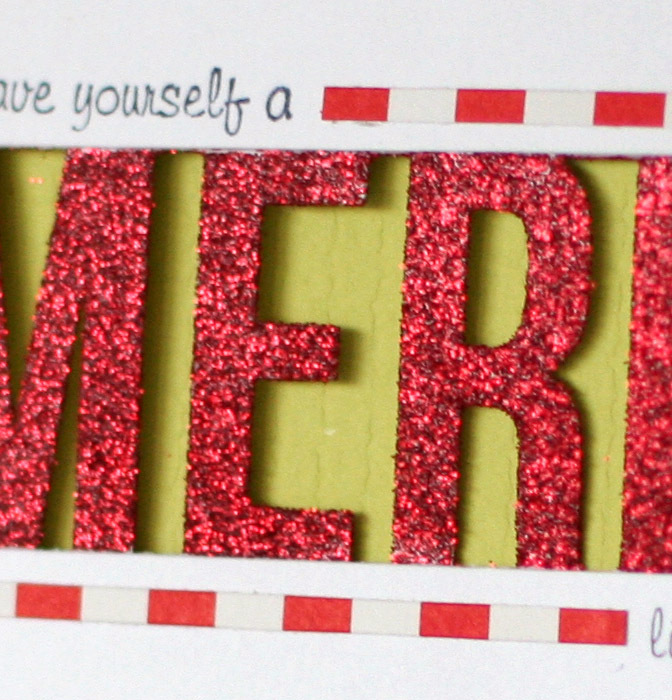 For this glittery greeting I masked off the card and used spray adhesive on the letters. I could have kept this a one-layer card, but I chickened out and stamped the masked sentiment on another panel. The glitter made such a mess that I'd hate to do it all over again if something went wrong! I would have preferred to have a small, diagonal, red & white striped paper for the border, but I stuck with what I had on hand. It works fine. Next up ... neon!! Love the colors. These papers are probably 10 years old from when I bought a huge variety pack at Target. Most of the years I've been using it as scrap paper to get rid of it, but now that neon is back it's become my good paper. 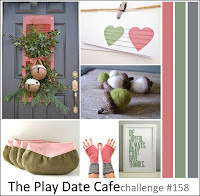 And when I saw the fun challenge at Moxie Fab to use neon, that was just the motivation I needed to dust them off. 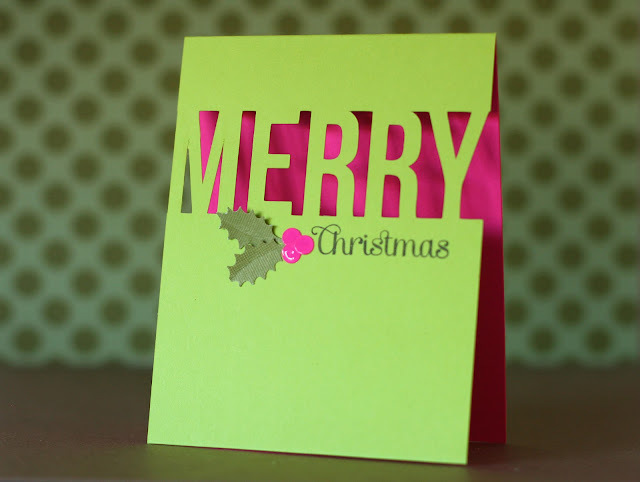 Same cut file here, just added the neon holly berries with dimensional glaze. The shine goes well with neon. 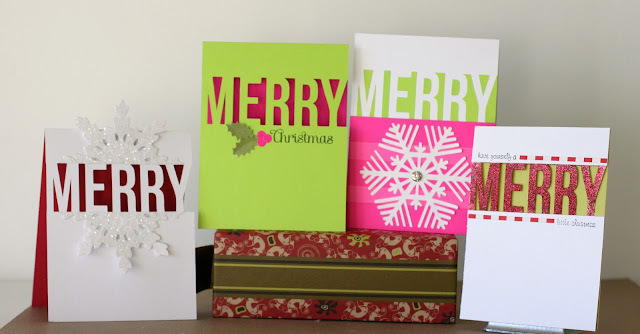 The last card uses the scraps from the previous card (I'm thrifty with my paper!) The negative cut came in handy as a guide to glue the "in between" shapes of the letters. 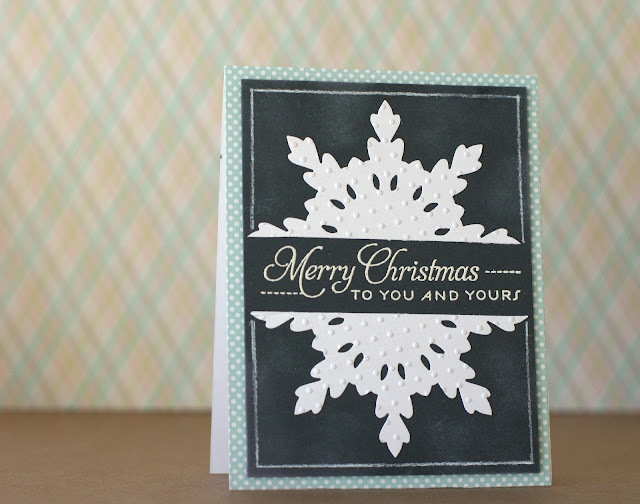 No Damask Snowflake on this card ... as beautiful as it is I wanted a more graphic pattern to go with the neon. This snowflake I cut while at my Mother-in-law's last month. She had a few new Cricut cartridges on her table that I couldn't resist, so I cut some designs hoping to use them later. This snowflake was a little big, so I extended the card base a tad. The screw in the middle is a brad ... liked the industrial look, and the Phillips markings actually look like a snowflake. Here they all are, same cut file, slightly different looks. 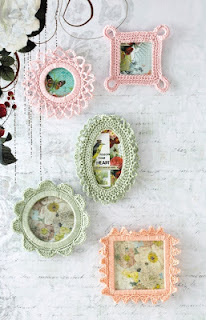 The dusty rose, mint and gray colors were quite a challenge for me. I kept wanting to leave either the rose or green out from whatever I tried. But I finally ended up with both colors on the same card. In an odd way the background snowflake reminded me of holly leaves, so I added the rose circles in the center to be like the holly berries. I have a few December birthdays so this is a subtly-themed, holiday birthday card. This is similar to my original split snowflake card, but it has more of a chalkboard feel with a chalk border, and white ink smudges. And blue polka dots for the CAS-ual Fridays challenge. Finally, a glittery snowflake, inspired by the Less Is More challenge to use glitz and glam. 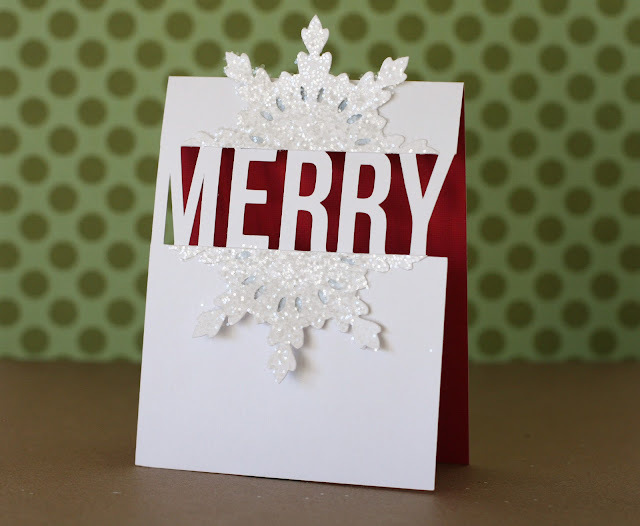 I added the vellum layer underneath to help give the snowflake dimension without taking too much away from the glittery layer on top. 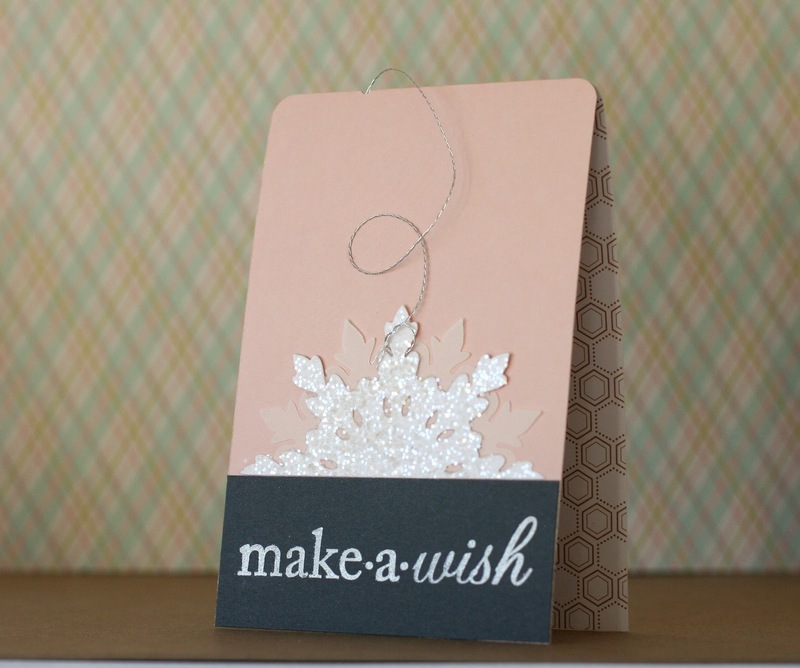 The silver "path" of the snowflake is run through a hole punched in the fold and taped down inside (love the hexagon pattern on the reverse side). I had to run out to Michael's for more embossing powder. I don't emboss too often, so when I tried it last night I was surprised to find the powder had yellowed slightly. It's probably 10-15 years old! 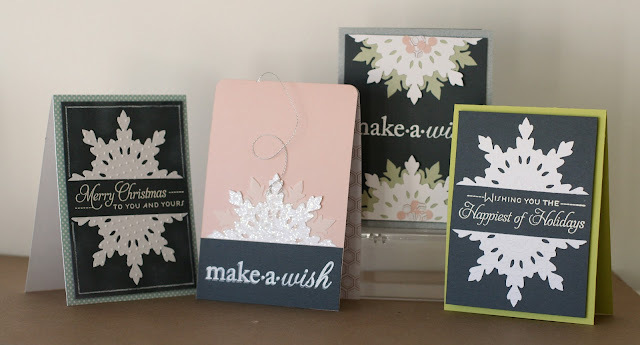 Cutting apart die cuts is the theme of this week's Make It Monday ... another great way to get more mileage out of the stuff we already have. This card came together in minutes. The larger side of the Mehndi Medallion impression plate ends up being the perfect size to make a symmetrical impression on the snowflake. 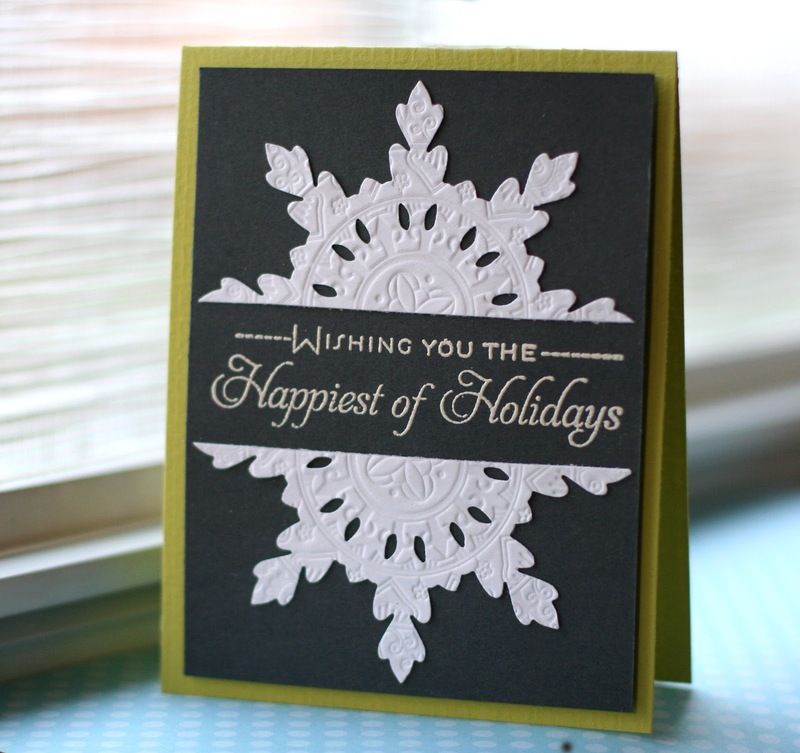 Washi tape helps make sure the snowflake stays in the center while running through the die cutter. This was such a quick and easy card that I've got a few other ideas which I may post tomorrow. 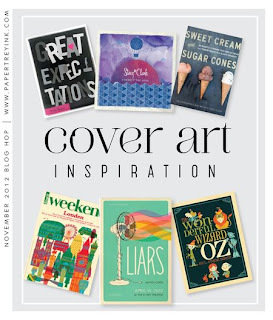 Creative inspiration is coming from book cover art this month at the Papertrey Blog Hop. This one is definitely challenging. I decided to focus on the last row of covers and came up with two cards. 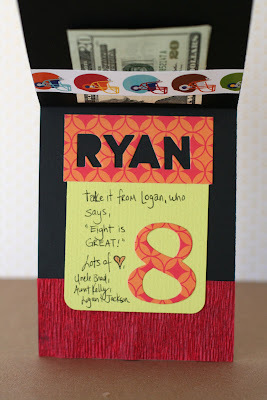 First is a birthday card for our nephew Ryan (Samuel's brother). It's inspired by the word art Wizard of Oz book cover. Originally I mounted the orange paper on pop dots, but that wasn't too sturdy, especially for mailing, so I die cut the wobbly circle out of 4 pieces of cardboard. After adhering each layer together, I was much happier with how thick and solid the support is. 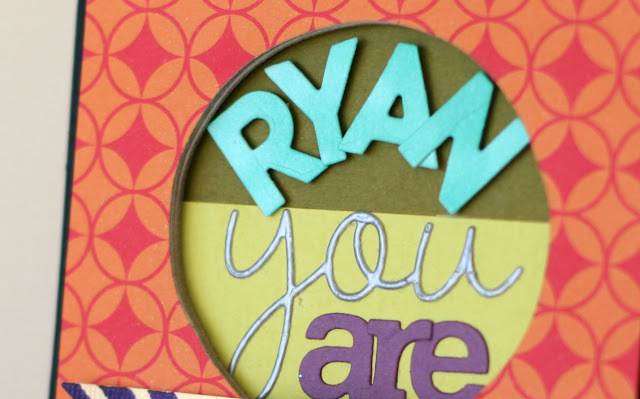 Can you guess what material the "you" is die cut from? 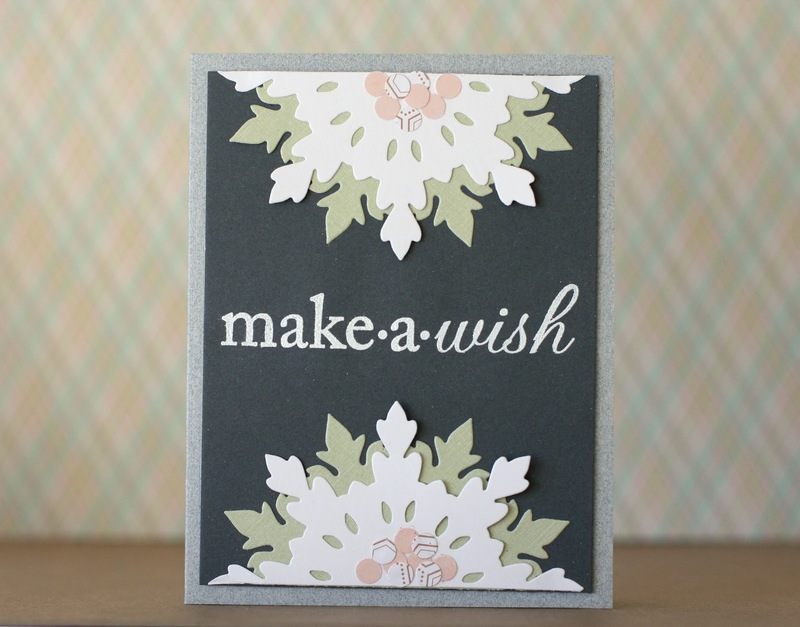 I had some on my craft table from a previous, non-card-related craft, and thought it would be fun to adhere the leftover piece to cardstock and run it through the die cutter. Love the shine, which is a perfect alternative to glitter for an eight year-old boy's birthday card, or any masculine birthday card. The "you are doggone great" sentiment is from the Tiny Treats set, but instead of using the actual stamp, I pieced together different words to recreate the sentiment, much like Betsy Veldman's MIM video on making the sentiment the focal point. To incorporate an image like the inspiration cover, I substituted the dog for the "A" in "great". The second card was inspired from the 60's/70's drawings on the Weekend Londen cover. 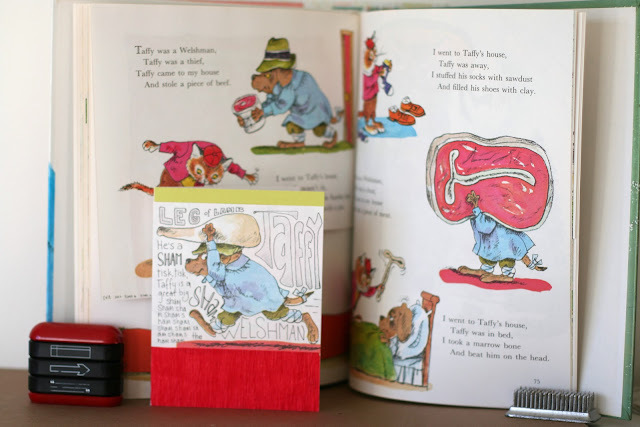 My God Son's 12th birthday is coming up and he's got a dry sense of humor, so I though it would be a perfect time to go through the Richard Scarry's Best Mother Goose Ever book (grabbed out of the donation pile). This Taffy guy stealing a leg of lamb just cracks me up. Who would make up a nursery rhyme about someone stealing meat?! Scraps again on the inside, as well as the portion of the nursery rhyme that goes with the illustration. 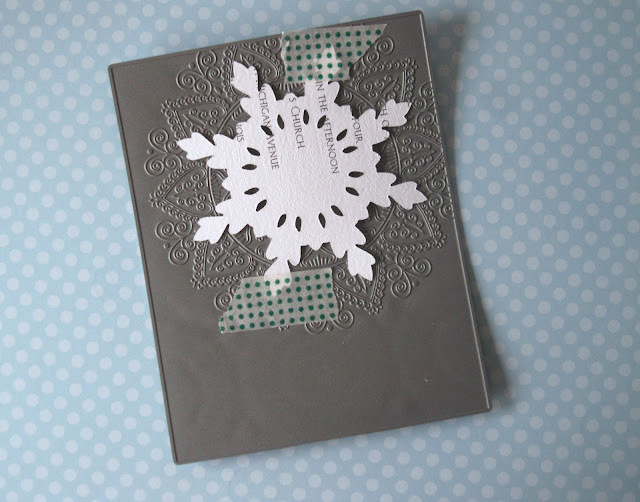 Here's a winter snowflake card from the Winter issue of Inspired by Family Magazine. 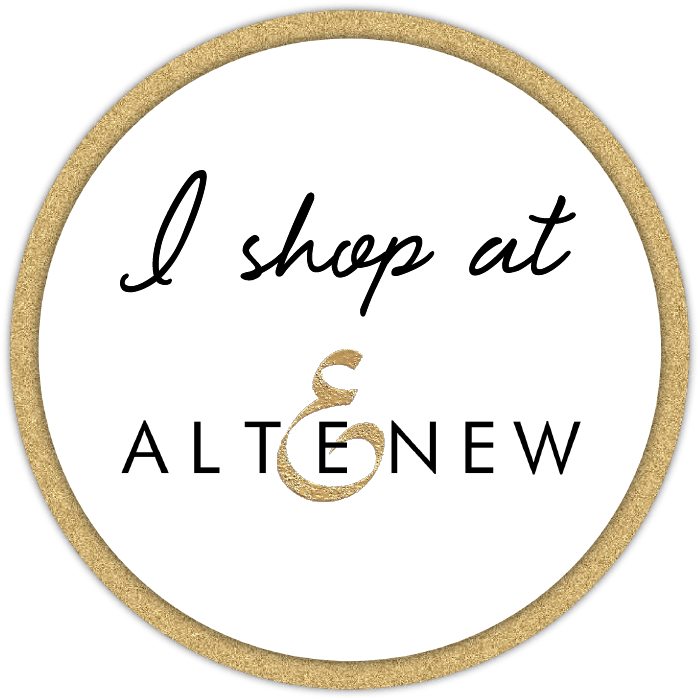 If you check out the e-zine, you'll find 84 pages of recipes, crafts, gift ideas, home decor, holiday party ideas, and more. One neat idea from this issue is to use dollar bills to make a band around your solid-color, wrapped present (like a wide ribbon). Totally unexpected, and perfect for a kid! 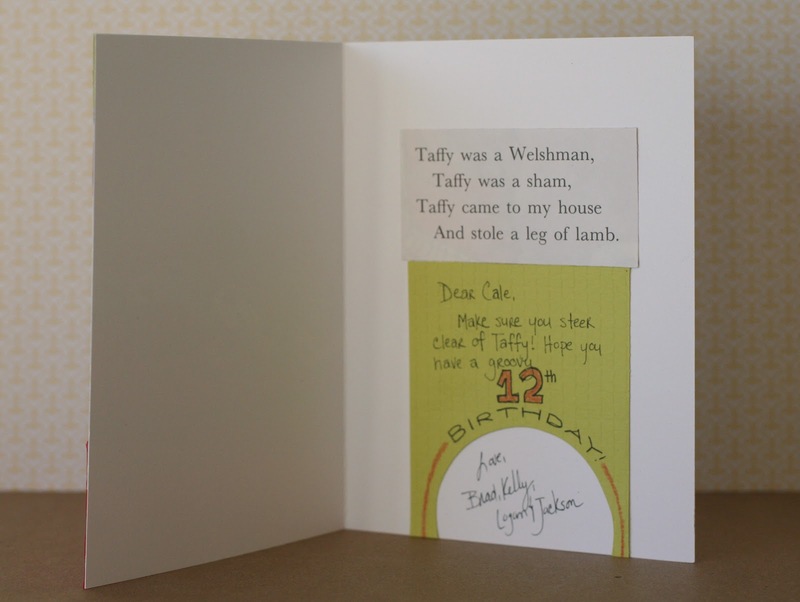 Anyway, back to the card. Not much ends up in the garbage around here. All my odds and ends from prior card projects go in a shoe box lid (not a box, the sides can't be too tall otherwise I would fill it). I dig through it when I need something even if I don't know what I'm looking for. That was the case with this card. Even though it has lots of layers, it came together in minutes as I grabbed several things from my scrap pile. 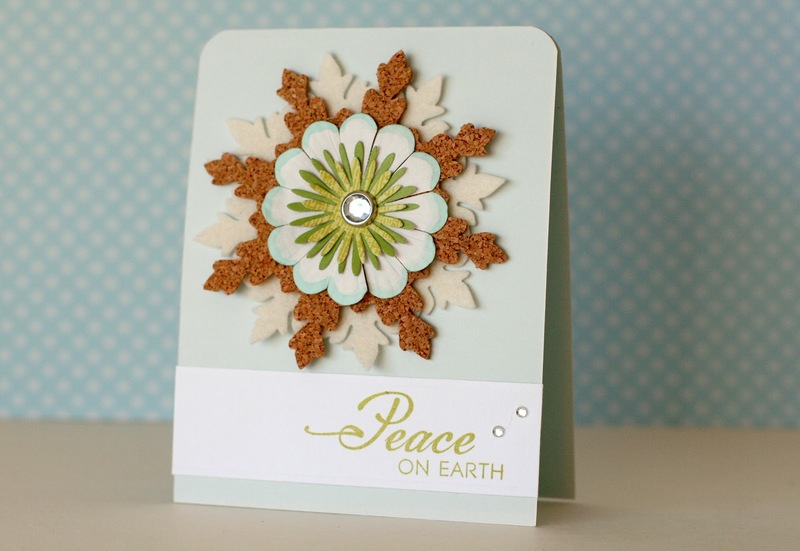 I found a felt snowflake die cut and some flowers, die cut another snowflake out of cork, and added a sparkly brad in the center. The ends of the flower petals are colored blue to match the card base. A really quick handmade card. 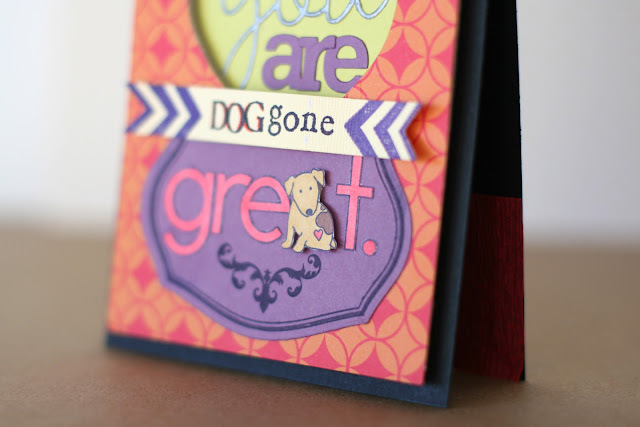 Playing with CAS-ual Fridays challenge to use blue, and the Moxie Fab challenge to use cork. In an amazing reminder that "life goes on," we learned of a precious son who was born in our family on the same day as Samuel's car accident. It's difficult to switch gears, but at the same time a welcome distraction. 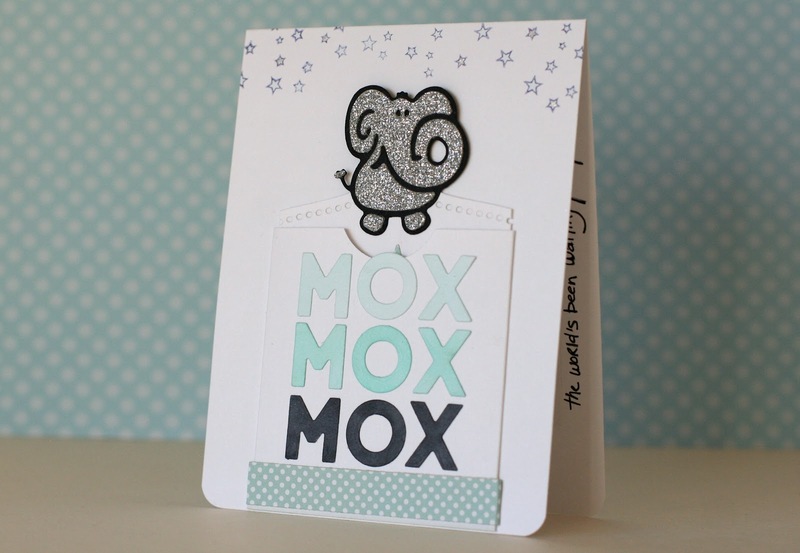 His name is Mox. Isn't that awesome? So simple, yet so different. As new parents, I thought they would get a kick out of seeing their first-born son's name in print, so I added it in triplicate to the front of the card. I like the idea of a faux pocket from the MIM technique explained this week. 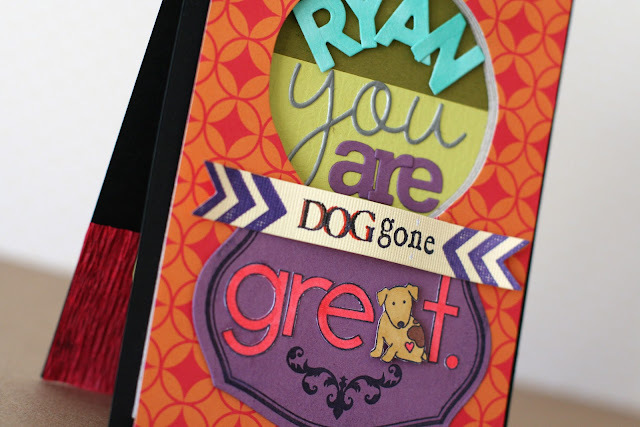 The top of the tag is die cut by running the Banner Builders Borders die part of the way through (with a cardboard shim to stop it before it cut the border off). 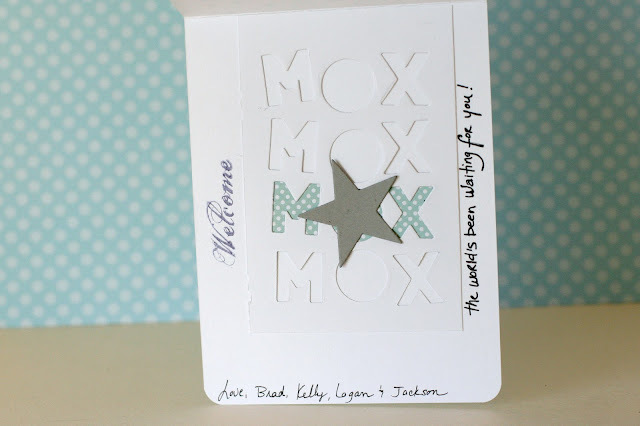 The medium Papertrey star is cut out of the large Papertrey star to get the outline effect. In the middle is the birth date, and some really hard-to-see glitter. The stars on the bottom of the tag match the stars on the top of the card. 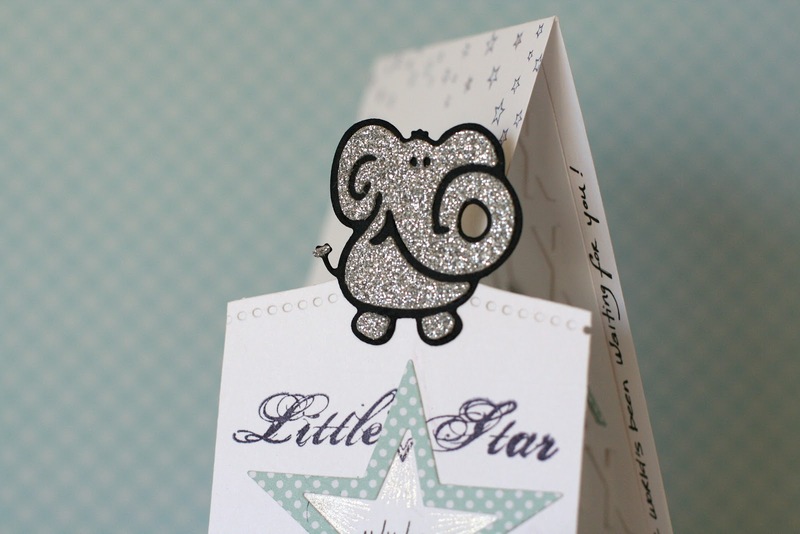 I resisted my hoarding tendencies and used my ridiculously thick American Crafts glitter paper to make a sparkling elephant. It's the Cuttle Kids elephant, one of my first die cuts! 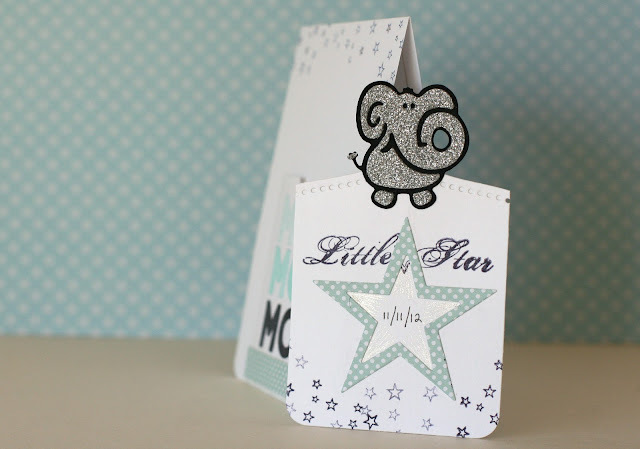 Adding the elephant to the top of the tag was inspired by this amazing card at CASE Study by Angeline Yong. 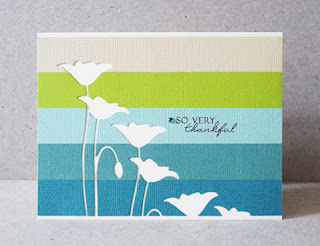 I've been challenging myself lately to use my scraps on the inside of the card. I figure since nothing much is usually expected there, anything other than your message may be a pleasant surprise. 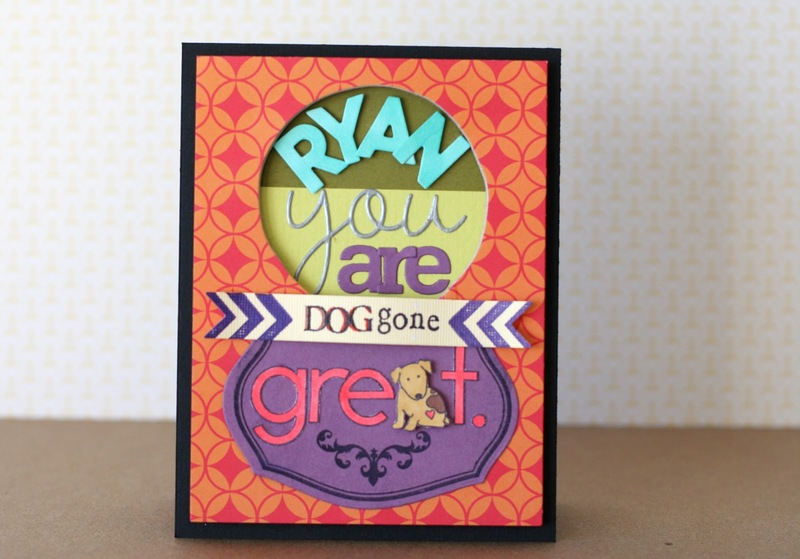 In this case I grabbed the negative die cut paper out of the trash. Definitely not something I created with the intention of using, hence the very uneven letters. But, I think that's why I like it. It's definitely more difficult for me to make an "artsy" card than a CAS card, so sometimes I have to rely on unintended elements. 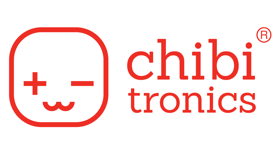 I wasn't going to write this post. Some things are private and should be kept out of cyberspace. But the more I thought about it, the more I felt it should be shared. He should be shared. His life was too precious for more people not to know about him. This weekend we had a great visit with our nieces and nephews from Texas. They were in town for their grandmother's funeral. We don't get to see them too often due to the distance between us, but for the kids it was like they saw each other every weekend. They get along so well, and we had a fantastic time catching up with the adults around a table full of pizzas. The photo above is from the last family photo taken before we all left on Friday. On the last hour of their 19 hour drive home, they were struck head on, by a driver who should not have been on the road. The van filled with 10 family members flipped over several times. Our brother-in-law was thrown 25 feet and sustained several broken bones. 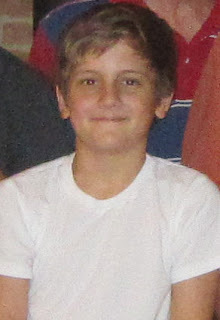 Our eleven-year-old nephew, Samuel, was also thrown from the vehicle and suffered massive head trauma. He died instantly. My first reaction was, "that's not possible, we just saw them on Friday." Silly, isn't it? Of course that doesn't matter. But, sometimes you just get accustomed to "knowing" when someone is going to die. They're sick. They have cancer. They're in the hospital. They're old. Not someone with a personality beyond his years. Not such a talented artist. Not a boy who, on Friday, put his arm around his 2 year-old cousin and told her, "I love you." So today we give our family extra hugs, extra kisses, extra tolerance for behavior that does not fall within our old vision of what's proper. Does it really matter that my child is in my face as I'm trying to type on the computer? Maybe not, maybe that's a sign that I need to stop what I'm doing and make some room for quality time with him. It's tough to balance priorities, but I think there is a lesson to be learned here. You hear it so often, "life is short." But do we really understand what that means? Do we really have that mantra front-and-center as we go about our lives? Do we need to wait for something tragic to happen in order to understand this and act accordingly? As heartbreaking as this is, we are so incredibly thankful that the other 9 family members are, or will be, physically OK. It could have been much worse. And for that we will say a special prayer next week at Thanksgiving. I couldn't bear to send them a sympathy card. 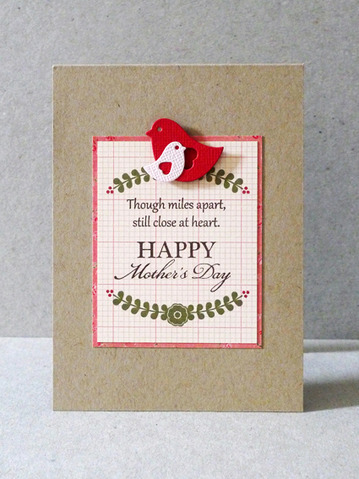 How could I send a sympathy card for someone so young? It might not make sense, but it just wasn't what I wanted to say. They know of my sympathy. 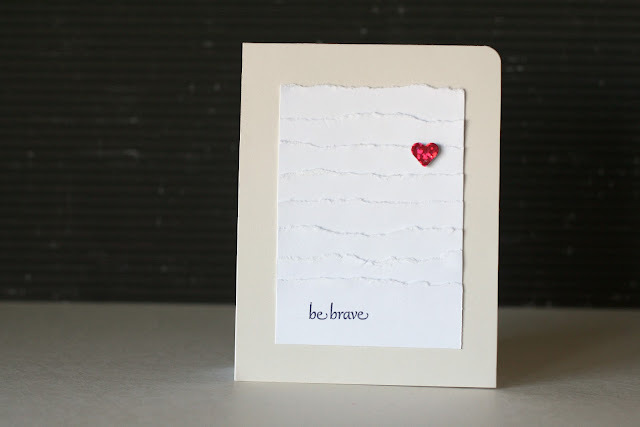 What I chose to do instead was send a card with a "be brave" sentiment. Because that's what I really wanted to tell them. They have such a long and painful road ahead of them, and they will need to be brave to help each other on this journey. So that is what my prayers are for them, to be brave. Thanks so much for looking, and for any prayers you may have for Samuel and his family. PS, I know as card makers sometimes we end up with more cards than occasions to send them. If that's you, and you would like to send one of those cards to Samuel's parents, feel free to contact me and I'll give you their address. 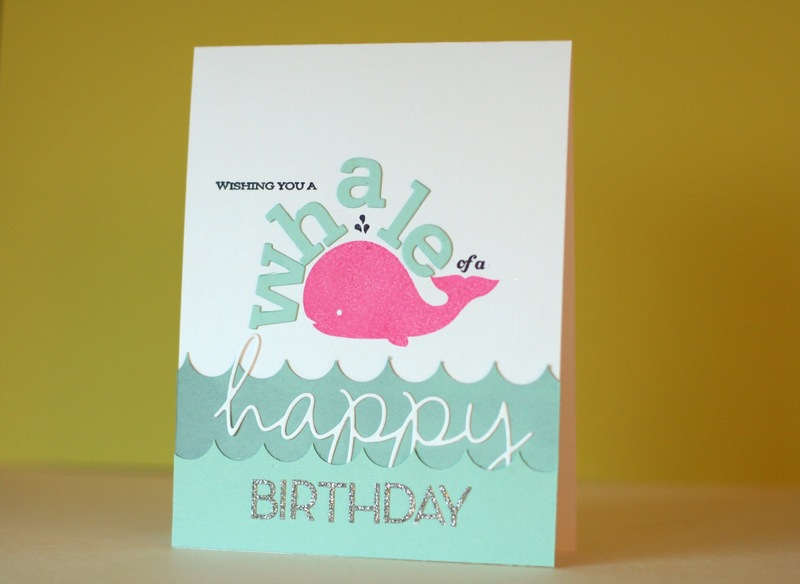 Here's a little whale happy birthday card, who's caught blowing the "a" off the sentiment. This is the original sentiment, but following this week's inspiring MIM challenge to split up your sentiment stamps, I selectively inked the words to stamp around the PINK whale in the middle of the card. Also playing along with the Moxie Fab challenge to use alphabet stickers, I was happy to dig in my drawer to find some sparkly ones. I've been forgetting about them for many years now. I've wanted to make some word art cards for awhile, especially after seeing all the hot subway art on Pinterest for so long. 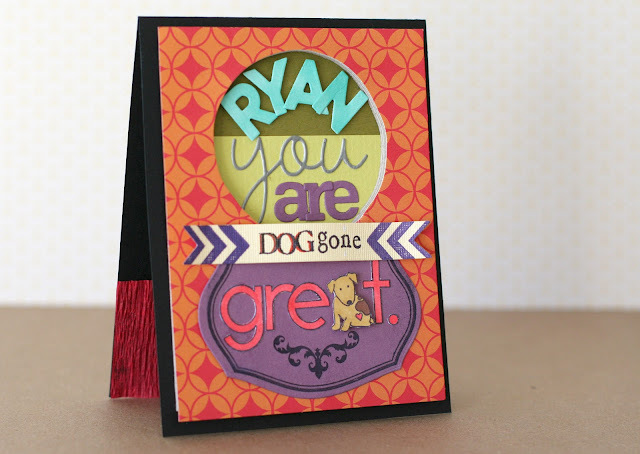 So I was excited to see Betsy Veldman demoing a MIM technique to split up a sentiment stamp and use your own die cut letters. 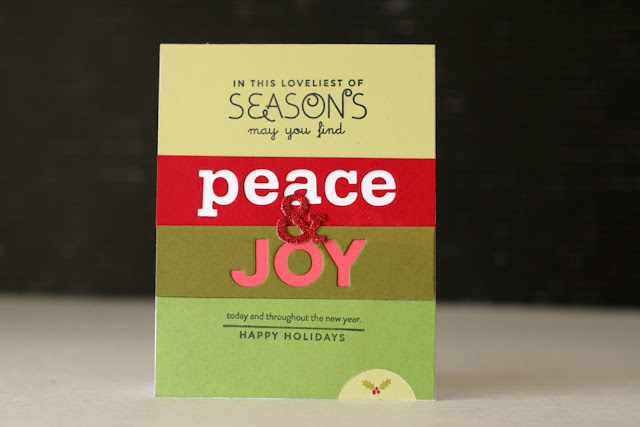 Here's the original stamp, from Papertrey Ink's new Over Under Easy Additions set. I inked the top three lines, added my own die cut letters, and then inked up the last two lines. I love how this technique turns an inside-the-card-sentiment stamp into a front-of-the-card focal point. Way to get more mileage out of your stamps! 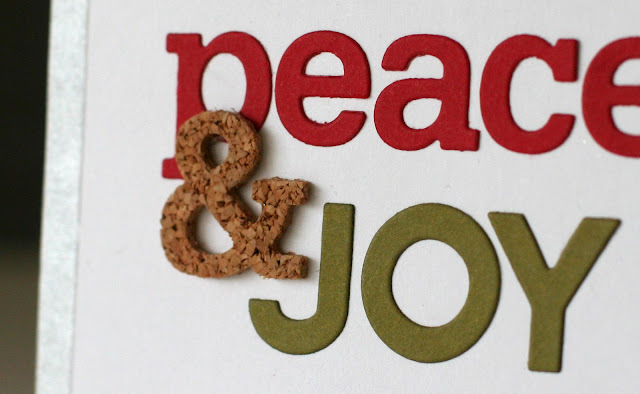 The ampersand is cut out of cork, inspired by the Moxie Fab challenge to use cork. I like pairing a rustic, textured cork with a modern, graphic card that has hammered silver on the edges. Completely opposite. 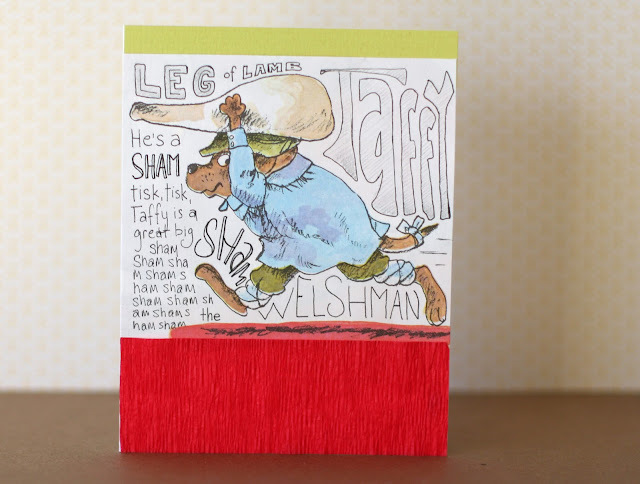 But, if the opposite rule works in the world of interior design, why not on a card, right? 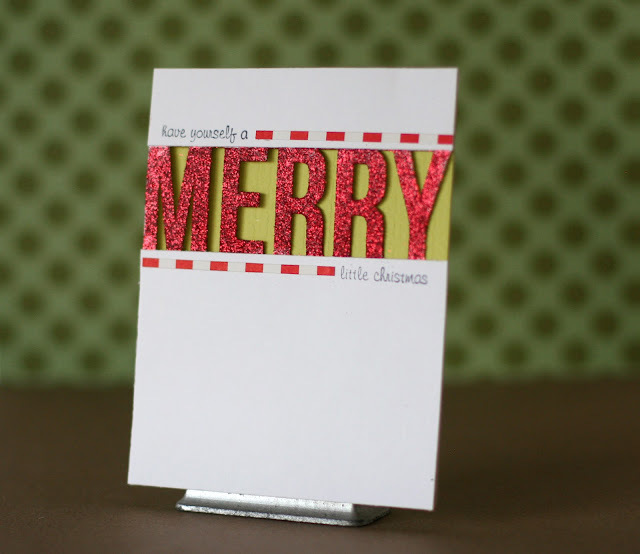 Here's another word art card, this time with plaid and some bling. 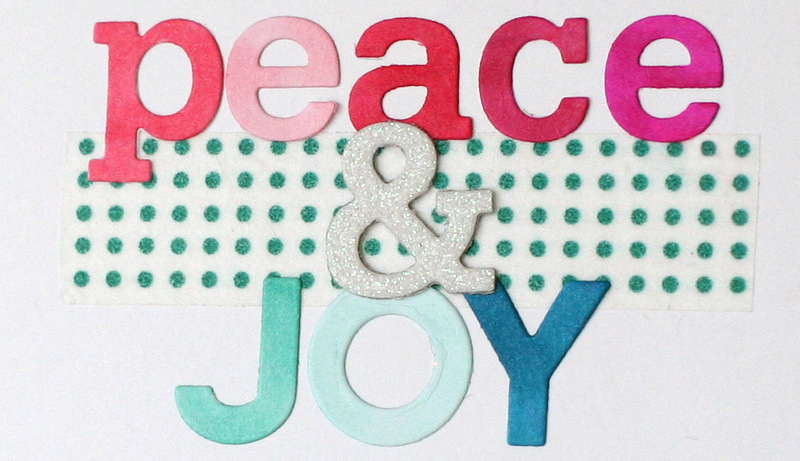 I was using the washi tape to position the die cut letters (so I could see where it should go without having to move each letter one-by-one) and then thought it actually looked pretty neat on the card. So I put a strip on and added the letters to the top and bottom, with a sparkly ampersand in the middle. I stuck to the color-blocked background, and used negative die cuts for the letter and the little half circle window on the bottom where I put the holly leaves. Originally, the "peace & JOY" were both on the white cardstock base, but I liked adding a little color to the JOY. The two colors don't necessarily go together, but I think that's why I like it. It's a little off, but in the context of the whole card, still in the ballpark. Also, you remember that I'm lazy, right? 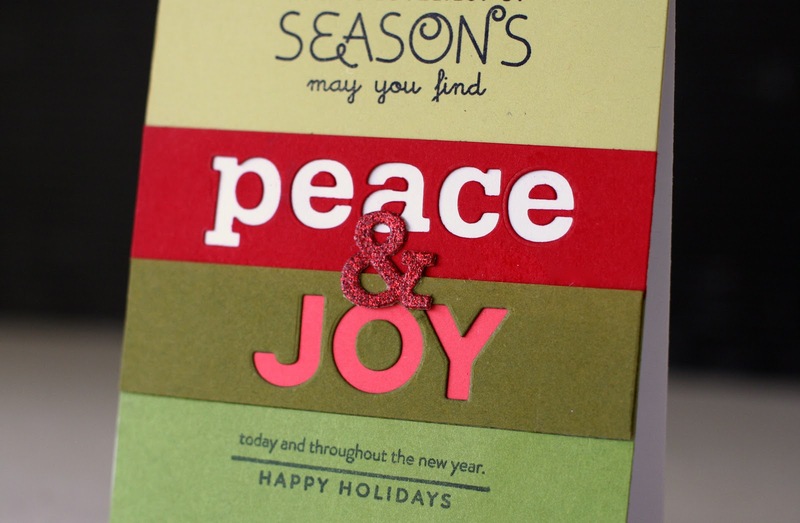 Can you tell where the die-cut letters in the first card came from? Yep, nothing goes to waste here. One card's negative is another card's positive!